The Yu-Gi-Oh! TCG Code of the Duelist Special Edition is the ultimate value for Duelists! In addition to 3 booster packs of Code of the Duelist, each box is guaranteed 1 of 2 Super Rare variant cards, PLUS 1 of 2 Super Rare preview cards of non-foil cards from the upcoming Fall 2017 booster set! Code of the Duelist is the newest 100-card booster set that combines Fusion, Ritual, Synchro, Xyz, Pendulum, and the brand-new Link Monsters to kick off a new Dueling era of Yu-Gi-Oh! Code of the Duelist introduces the first new Deck strategies where the position of your cards matters just as much as which cards you play! There are endless possibilities for new strategies thanks to Link Monsters, and Code of the Duelist starts with 3 new ones, along with more cards to enhance the strategy from the new Starter Deck: Link Strike. You’re guaranteed one of these Super Rare variant cards in your Special Edition box, either Skull Meister or Solemn Strike, plus 1 of 2 Super Rare preview cards from the Fall 2017 booster set, AND the 27 cards you pull from your 3 booster packs! Yu-Gi-Oh! 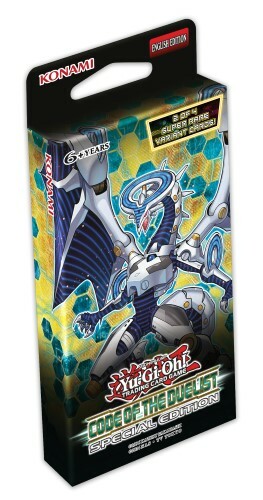 TCG Code of the Duelist Special Edition is a great way to power up your current Deck, or build a whole new Deck, for less than it would cost to buy 3 individual booster packs!